The World of Radio features the central figure of soprano and radio star Jessica Dragonette (American, 1900–1980). 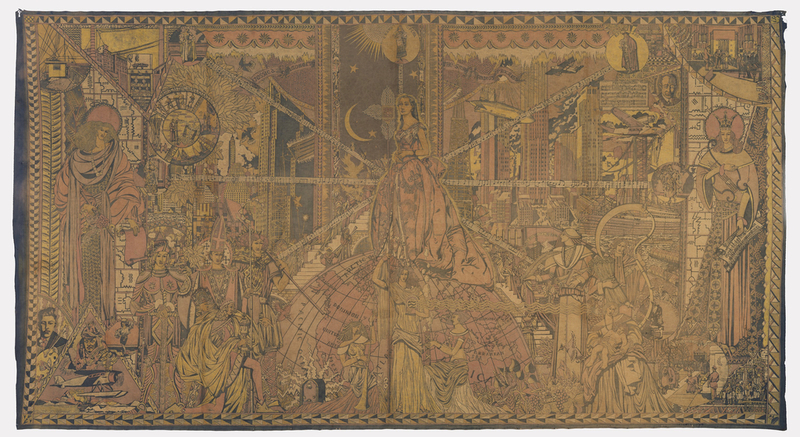 Commissioned in 1933 by her sister, Nadea Dragonette Loftus, this mesmerizing mural decorated the singer’s top-floor apartment on East 57th Street. Over 8 feet high and 16 feet wide, the mural is a highly personal tribute to Dragonette’s career in radio and illustrates her personal connection to important moments in radio’s history and development. As one of the most celebrated radio performers of the 1930s, Dragonette brought operetta and semi-classical music to over 60 million listeners weekly. The radio star is depicted atop a globe against New York City skyscrapers with musical notes radiating in all directions behind her. She is surrounded by allegorical medieval figures and vignettes that illustrate milestones in her career and radio in general. Some of these achievements include radio broadcasts to Admiral Byrd in the South Pole; a depiction of a rooftop shack that was home to station KDKA, the first radio station with a regular broadcast schedule; and Dragonette’s 1930 debut on NBC’s Cities Service Concert program, which made her a Friday night fixture in the homes of millions of Americans. The World of Radio has not been exhibited since 1978 and is on view through September 24, 2017.